Posted on Nov 28, 2011 by Appleton Downtown Inc. I love Christmas and always have! So starting when I was a teen-ager, whenever I traveled I would look for the perfect Christmas ornament to remind me of the trip. Every year when I decorate the tree, I tell the story of each ornament as I unpack and hang it. Now that my children are 17 and 20, they can recite the stories…although perhaps a little sarcastically…this lighthouse is from our trip to the Outer Banks as a family in 2000, these are the cherries from Mom’s trip to Washington DC in high school…. Of course, I carried the tradition on for my children and added to it by giving them an ornament each year so in the future their own tree will hold lots of memories! I love searching the local stores for the perfect momento of the year. 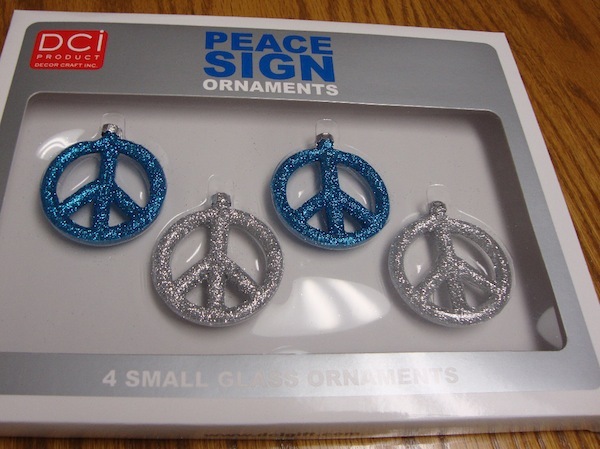 Last year I bought my daughter peace sign ornaments at Just Act Natural in her favorite colors. Any suggestions for where to look this year?